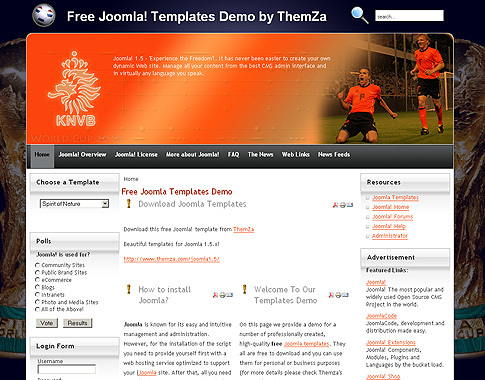 With the World Cup 2010 coming to its historic final, ThemZa has prepared for you a new set of hot Joomla 1.5 templates to add a fresh look to your football portal or diary. These are the World Cup Heroes and the World Cup Nations templates, letting you share the most spectacular and memorable moments and scores and the best players on the South African stadiums this football summer. The World Cup Heroes Joomla template offers the following team options for your Joomla based football site: England, The Netherlands, France, Italy, Spain, Portugal, Brazil, Argentina). The World Cup Nations Joomla template in turn allows you to make your national team choice out of the following country options: Holland, Portugal, Australia, Italy, Uruguay, Japan, United States, and England. This entry was posted on Tuesday, July 6th, 2010 at 3:46 pm	and is filed under Joomla 1.5.x. You can follow any responses to this entry through the RSS 2.0 feed. You can leave a response, or trackback from your own site.